Based on this week’s series, what are the commercial, residential and retail indicators that personal safety is improving in formerly unsafe neighbhorhoods, and that it may be time to invest? Cool companies: This is often the first indicator, assuming workplaces ever become a common component in the neigborhood, since they’re inhabited during the day. In DUMBO (Down Under Manhattan Bridge Overpass), Brooklyn, NY, Jacques Torres, one of the ‘best known pastry chefs on the planet’ and a modern Willy Wonka, at last count had 18 employees producing 50 tons of chocolate a year. He plans on tripling his business. In Baltimore, MD, a group of fast-growth companies transformed an abandoned factory into an economic anchor that has arguably single-handedly revitalized a place where no one would even drive through at night. 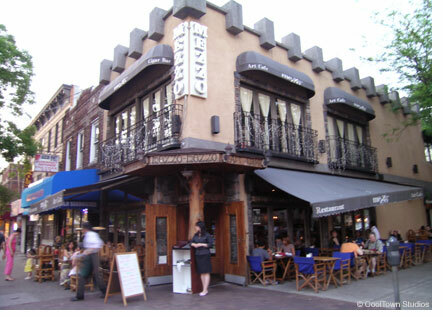 Cool retail entertainment: Once the Mezzo Restaurant & Lounge (pictured) in Astoria, Queens, NY – a restaurant/bar with live music, outdoor seating and inviting atmosphere – opened its doors a few years ago, the property values around it began to rise on cue. The same happened in Madison, WI, and many other places. Places that draw throngs of patrons also provide that eyes on the street. Cool housing: Lofts, lofts, lofts. The easiest ascension from industrial wasteland to desirable community is redesigning the warehouses into lofts. This is usually the last indicator that public safety is improving, mainly because the residents are doing most of their walking at night and will wait for the other two indicators to arrive first. However, it’s the best sign that a neigborhood has turned the corner… better hurry.